Gadabout Gaddis - Friends send emails of praise for this American Hero!! THIS E-MAIL MESSAGE WENT OUT TO THE FISHING NEWSGROUPS!! Growing up, before the proliferation of fishing shows, there was Gadabout Gaddis (circa 1967). Gadabout, a white-haired man would jump in his float plane and go to some of the most beautiful and remote places on earth with his white Shakespeare rods. He was akin to the old Field & Stream .. Outdoor Life Fishing lore of old, sitting around a pot bellied stove and telling tall tales! I was wondering if anyone has a video of any of Gadabout's shows. I don't know if his shows were ever saved or whatever. 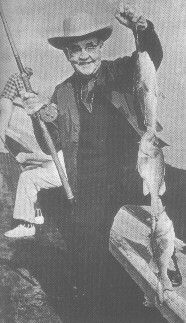 His show would sure stand out today where the fishing shows more or less resemble Manhattan Public access tv with some guy muttering inane thoughts while hooking into a bass. 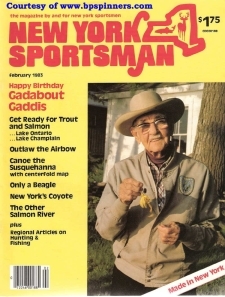 Gadabout was introspective and kind of a hero to me in his white cowboy hat as he galloped in his seaplane through the skies in his mystical search for pristine wilderness and fishing holes. I checked up on the old American Sportsman tapes at ABC a few years ago, talked with one person who steered me to another woman who was in charge of their library, but she was out to lunch...never did call back. I'd sure like to check up on that again..to get those Lee Wulff/Curt Gowdy trips into the Minipi region of Labrador, as well as the Joe Brooks episodes. Those were/would_be Golden. Yep, ol' Gadabout was something else. I remember being 6 or 7 and watching him every Sat. He was on right after Roy Rogers and before "Wide World of Sports". An interesting Gadabout story. I have a friend in Ohio who knew Gadabout quite well. He and some friends met him on a river down in Florida (where he lived)...My buddy's on air traffic controller (and pilot), so he and Gadabout got to be pretty tight. Every year Jim would fly down to visit and Bass fish with him. Turns out ol' Gaddabout was as good a pilot as he was a fisherman (and I remember him to be pretty good at that). Jim had some wonderful stories about Gadd and his flying days. The way I understand it, Gadabout was no young pup when Jim met him. He wasn't flying anymore due to poor eyesight (as I recall). Anyway, Gadabout still had his airplane (A Cherokee I believe) and Jim used to take him up and fly him around whenever he was down visiting. Don't remember the exact details of some of the fishing stories but the were very entertaining at the time...had some great pictures as well. I have a fishing show on radio & TV here on Long Island and he was a hero to me also. Let me know if anyone comes through. Thanks. Fishline6 member of OWAA, NYSOGA, licensed guide. Tight lines to you all!! My grandmother's sister was the pilot of that float plane along with her husband. Gadabout had no family of his own so he was adopted into ours. He lived well into his 90s and died just a few years ago. The family took care of him right up untill the end. My grandmother's sister is still alive and well in Florida. I will be visiting her next week. If there are any copies of the shows on tape I will do my best to make them available. UPDATE FROM MIKE - THE PREVIOUS LETTER !!! She had donated most of his fishing gear to different fishing museums around the country so they could shared by others. Gaddis had spent the last forty years of his life with Aunt Edna and she maintained several photo albums of his life many never seen outside the family. She did not have them with her in Florida but keeps them in Gaddis's last summer home on a beatuiful lake in central Maine. She invited me up there this summer to view them. I was wondering if you would be interested in having some for the web site. I am sure that she would be happy to make them available. I will try to locate a laptop to show her the work you have done. I am sure she will enjoy it. Before I left she gave me another copy of his biography. I now have two, one with his autograph. She also gave me a new deck of Gadabout Gaddis playing cards. I would like to make one set of cards available to you. Just a small token of appreciation for what you have done. I am sure Gadabout would want you to have them. Let me know if you are interested. Keep up the good work. Gadabout was cool, also rich. Little Lake George in Flordia called Hog Island. I had a Gadabout Gaddis book...in paperback. He wrote of his great adventures from his days as a hobo to his final glory of flying fisherman. He claims to have had the first syndicated TV show but it was much earlier than c. 1967...50's probably although he was doing non-syndicated stuff just a few years after TV got invented. Gadabout needs to be re-born in the form of a modern-day show host. Today's hosts are a bunch of candy asses. Gadabout could have whooped 'em. Write if you want to know the publisher of the book...I gave it away to a friend but could get that info for you. Your post on the old gaddabout show brought back fond memories of when I lived back there in CT many years ago.I saw most of his shows for most of the years it was on.I think of the ones that stand out in my mind were the one on the Matane river in Quebec province.also the kennebec in Maine but there were many more that were great.The old white wonder rod was what I got started with fly fishing.I think it was because of all those shows I watched.anyway if you should find out how to get hold of copies to his show please post or let me know via e-mail cause i sure would like to see some of them again. By the way last Oct I made a real nice trip to Conn,Maine,MASS, and R.I. mostly fished salt water with a friend from Conn.We had very good luck Spent a week on Marthas Vinyard fishing in the derby.we did not win but had a wonderful time and managed to catch many strippers the largest being 36 inches on a fly it was great to see such wonderful fishing back there much better now than 30 years ago. I found your Gadabout page today. What a blast! Kindred spirits on the Web! Your writeup could just as well have been written by me - just change Greenwich Village to Brooklyn. No one dared step between me and the TV set when Gadabout was on. How did we ever get from that great form of entertainment, to those bass-yankers who are always mumbling something about spahder wahr and are always trying to sell you something? Ironically, Gad was a sales rep for Shakespeare but he never explicitly sold the stuff through his TV show. The only thing he did sell was a set of six lures which cost the grand total of one dollar. This was done primarily to guage how many people were watching. I did buy a set of those and still have some of them. Lately, I've been giving my graphite rods a rest and have taken to swinging white Shakespeare rods around. There are plenty who don't understand why. Poor souls. As far as videos go, I have some good news and some bad. About fifteen years ago after buying my first VCR, I purchased a tape called "Fishing, USA". This was a collection of a dozen or so of the old Flying Fisherman shows, minus the commercials of course. I've watched this tape so many times that it's worn out in spots and appears jittery when you view it. I've been trying to locate a new copy but so far have come up empty. I did collect the following information, though: The "Fishing, USA" tape was produced by Video Gems and then later by G.G. Video. Another set of tapes entitled "The Flying Fisherman" (Volume 1 through Volume 4) was also produced by G.G. Video (in 1987). I've been trying desparately to locate these since they contain episodes not included in the "Fishing, USA" tape. I found all of this information in the Videolog at my local Blockbuster video store. I tried to order the tapes through Blockbuster and also Critics Choice Video, but was unsuccessful. I suspect that the Video Gems and G.G. Video production companies no longer exist. There must be copies of these tapes somewhere but its been a real challenge to find them. Another source of Gadabout stuff is his autobiography entitled "The Flying Fisherman". This book is not too hard to find through book dealers that specialize in fishing books. I would recommend Judith Bowman Books in New York as a source. Another book that I found was published by Liberty Mutual Insurance and described the fishing at most of the locations that were visited by Gadabout on his TV series. 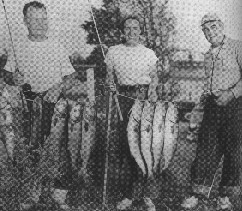 An old issue of the "New York Sportsman" magazine contains an article about Gadabout and his experiences fishing in New York state. It was written by Ken Coleman, who was another Shakespeare rep that took over some of Gadabout's sales territory. By the way Gadabout died in 1986 at the age of 90. He is buried in the town of Moscow, Maine. An airport in nearby Bingham, Maine is named after him. I've been trying to collect as much info on Gadabout as I can find. Let me know if come up with any sources, especially the videos, and I'll do the same for you. I was in Sagamore, Ma. (Cape Cod) a few years ago and spotted an old Lyman type boat complete with outboard and trailer, in pretty tough shape. An older fellow came out of the house and told me his son was looking for just a few hundred dollars for the boat. Having too many boats of my own I passed. A few weeks later I went by and the boat was sold. Come to find out the man's son had bought it from Gadabout just before he moved to Fla. It was the boat Gadabout used in all his Cape Cod fishing tv shows. Damn.. I enjoyed your pages about Mr. Gaddis. As a 20 year old GI during my Viet Nam era training in Biloxi, Miss. I enjoyed his fishing shows a great deal. Being from Florida and away from home his trips were a welcome weekly "vacation." Coincidentally, I was thinking about him the other day and the way he could make a popping bug hop across the water. That's been a solid 30 years since I watched him. I'd say he had an affect on me. Thanks for taking me back. WOW! Thank you so much for the Gadabout WEB pages! Many many memorie and warm fuzzy feelings when at probably 12 or 13 I'd sit glued to that old B&W TV and watch SkyKing, Roy Rogers, and the Gadabout Gaddis followed by Wide World of Sports!!! I have heard recently that someone else now uses the monicker "Gadabout GAddis" and was in the local sportsman show in Cleveland last year? It seems the name trademark was not renewed. Do you know anything about it? I forgot to include one additional bit of info in my previous message. I also found a tape called "Fly Fishing in America". It is hosted by Homer Circle and involves several fishing personalities demonstrating their brand of flyfishing. First one up on the tape is Ole Gad who talks about bass fishing with a fly rod. It's nice but much too short. Also included is a very short clip from one of the films Gadabout made in the 1940's. The tape is produced by Sports Scan and distributed by Karol Video. When I saw your message on Gadabout I was surprised that people still knew who he was. Everyone seems to be caught up in all the staged fishing shows and forgotten what honestly is. Much of what I put in the e-mail was taken from the 1991 edition of my bibliography, Books of the Black Bass. I had one other entry that mentioned a story about Gadabout and I'll add those two entries here, just in case you might be interested. *GADDIS, ROSCOE V. "GADABOUT" (as told to George Sullivan) - The Flying Fisherman. 8vo. 182 pages. 1967. Trident Press. NY. The life story of the first fisherman to become a national TV personality because of his fishing. 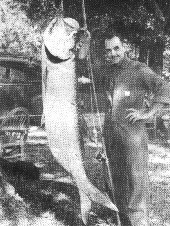 Gadabout was a salesman for Shakespeare and began filming his fishing trips to use in getting him in front of sportsman's groups in his territory. Later he flew his own airplane around the country and was able to visit all the top fishing spots. Although he visited all the top fishing spots he still featured bluegill, crappie and catfish as often as he did the so called exotic sport fish. I have always enjoyed fishing shows but this is the only one that I ever made a conscious effort to watch. I never felt that Gadabout was putting us on, if he went fishing and didn't catch anything that is the way it was shown on TV. Twenty years ago when I was in Spokane, a renowned TV fisherman spent a whole week on a local lake filming a half hour show. I never watched that particular show again. This book included some on Black Bass. Also a paperback edition by Pocket Books, NY, 16mo. Not dated. *BRYANT, NELSON - Fresh Air, Bright Water. 8vo. 283 pages. 1971(c). American Heritage Press. NY. Reprints of some 125 stories from Bryant's column, Wood, Field and Stream, in the New York Times. Consists of two or three page short stories. 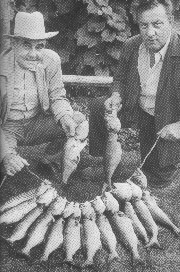 Pages 98-99, Gadabout Gaddis Gives Lessons On Kennebec River Smallmouth Bass. Another story concerns Bass fishing in the Everglades. Bass are mentioned in several other stories. There are more stories about salt water fishing than anything else. Like you, I remember fondly being brought up with the flying fisherman. Not until I was in my 40's did his memory come back to life. I spent 5 years teaching in Bingham, ME the home of Gad and worked often with my students at the annual fly-in at the Gadabout Gaddis Airport. In 1986, I purchased Penobscot Lake Lodge and found in the photo archives several pictures of old R.V. standing next to his plane at the end of the dock. I had another one also of Paul Newman and wife Joann boarding the plane for the trip back to Greenville. My most interesting possession is a signed copy of Gad's book The Flying Fisherman. Good work and thanks for the memories. Talk about the first fisherman to be on tv. I was about 13 when I first saw him on WRGB out of Albany NewYork. What he did then was amazing. The places he visited and as you say the look of the cowboy. Like Roy Rogers and Hopalong Cassidy. Yea I remember, I am glad to see that someone else does also. I wonder if Bill Dance and those guys ever heard of him. Best of luck in finding the films.Maybe the old TV station may have some in their archives. Look at 1947 or 48. Let me know how you make out. where are you form. I was originally from the Pittsfield ma area. WRGB is one of the oldest tv stations around if not the oldest affilliate of NBC. Like to hear from you. From: "Eric & Judy Arsenault"
Thank you for your Web Page on Gadabout Gaddis. Just before Christmas I was searching for fishing book prices for a friend who wanted to sell his collection. I was talking with a business man in Ontario, Canada, and on a lark, I asked him if he ever heard of Gadabout Gaddis. He immediately said " The Flying Fisherman". Boy ! was I happy and surprised. My story on this started in 1967 when I left Prince Edward Island to venture forth into the world. I left by train and my father gave me a book to read. It was " The Flying Fisherman". I have always been a trout fisherman and my father thought the book appropriate. I lost the book over the years and only recently thought about seeing if I could find a copy. Well, you can imagine my joy when this person told me he had 5 or 6 copies in good condition. I will soon be re-reading and getting aquainted with Gadabout again after so many years. I missed all the TV shows. On P.E.I. we only had one channel, Canadian Broadcasting Corp. with not the best of broadcasting. In reading your letters I did get Sky King, no Roy Rogers, and no Gadabout Gaddis. An interesting thing I did read in the letters was that Gadabout used a white Shakspeare rod. I find it ironic that I used a white Shakspeare rod from when I was 10 years old ( bought it with my paper money) until I discovered composite graphite in 1987. I still have two white rods stored. I take them out when fishing friends come in and tell them "tall tales" about the many great days I had fishing with them. permission to reprint several sections of Gadabout's book! Gadabout - His Biggest Fan (and possible replacement!) ! !